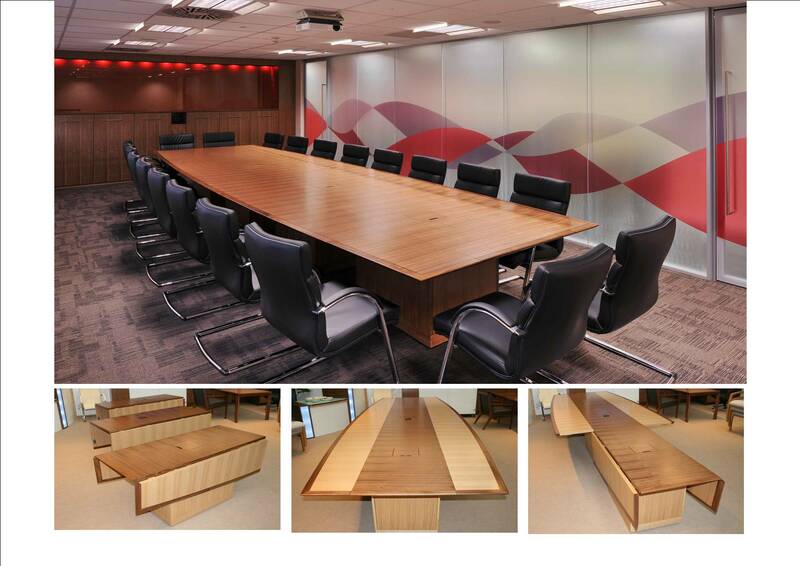 "The 'Change' Table - at last, a demountable table system that looks prestigious enough to actually have in the boardroom! In the example shown (in straight grained American Black Walnut) the three sections can be demounted and wheeled to the side of the room for use as serving tables, or out altogether through a standard doorway in about 2 minutes - without the use of tools! Electrical and data services are fully integrated into each table so user's can 'plug-and-play' in the same way as in a static table, with cables routed to the floor box via a hidden door in each base." Tables can be made to a special shape to optimally combine the shape and space and the focus and function of the room The 'Change' table in the drop-leaf variant. Converted to side tables or wheeled out of the room - no table!